March 7, 2016 – One year ago, on March 6, 2015, NASA’s Dawn spacecraft slid gently into orbit around Ceres, the largest body in the asteroid belt between Mars and Jupiter. Since then, the spacecraft has delivered a wealth of images and other data that open an exciting new window to the previously unexplored dwarf planet. “Ceres has defied our expectations and surprised us in many ways, thanks to a year’s worth of data from Dawn. We are hard at work on the mysteries the spacecraft has presented to us,” said Carol Raymond, deputy principal investigator for the mission, based at NASA’s Jet Propulsion Laboratory, Pasadena, California. Among Ceres’ most enigmatic features is a tall mountain the Dawn team named Ahuna Mons. This mountain appeared as a small, bright-sided bump on the surface as early as February 2015 from a distance of 29,000 miles (46,000 kilometers), before Dawn was captured into orbit. As Dawn circled Ceres at increasingly lower altitudes, the shape of this mysterious feature began to come into focus. From afar, Ahuna Mons looked to be pyramid-shaped, but upon closer inspection, it is best described as a dome with smooth, steep walls. Dawn’s latest images of Ahuna Mons, taken 120 times closer than in February 2015, reveal that this mountain has a lot of bright material on some of its slopes, and less on others. On its steepest side, it is about 3 miles (5 kilometers) high. The mountain has an average overall height of 2.5 miles (4 kilometers). It rises higher than Washington’s Mount Rainier and California’s Mount Whitney. About 420 miles (670 kilometers) northwest of Ahuna Mons lies the now-famous Occator Crater. Before Dawn arrived at Ceres, images of the dwarf planet from NASA’s Hubble Space Telescope showed a prominent bright patch on the surface. As Dawn approached Ceres, it became clear that there were at least two spots with high reflectivity. 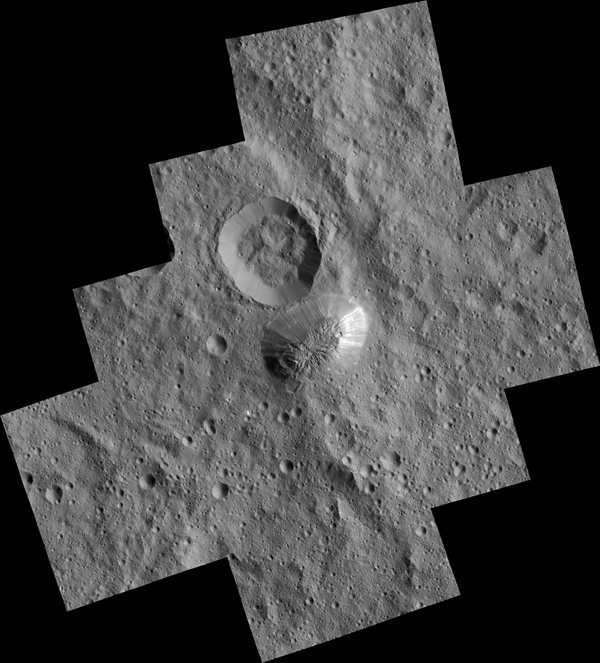 As the resolution of images improved, Dawn revealed to its earthly followers that there are at least 10 bright spots in this crater alone, with the brightest area on the entire body located in the center of the crater. It is not yet clear whether this bright material is the same as the material found on Ahuna Mons.